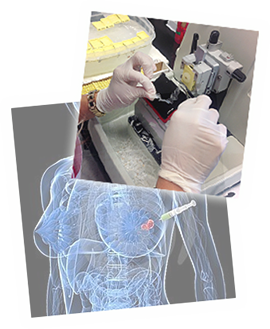 Biopsies determine whether a tumor is malignant, or it determines the cause of an unexplained infection or inflammation. Tissue samples are taken from tissue that appears changed in structure. SPL provides an expert biopsy service of evaluating colon, gastric, esophageal, tonsil, throat, thyroid, ear, prostate, and bladder specimens. SPL pathologists have expertise in evaluating these types of biopsies in our state-of-the art laboratory. Skin biopsy. SPL creates frozen slices from a sample of skin and one of our highly-accredited pathologists examines the slice to determine if melanoma is present. Shave biopsy. Shave biopsy evaluations are used to diagnose some basal cell or squamous cell skin cancers, but they are not recommended for suspected melanomas of the skin. Fine needle aspiration (FNA) biopsy. SPL examines very small pieces from a tumor extracted by a thin needle and syringe. FNA is not used for diagnosis of a suspicious mole, but may be used to biopsy large lymph nodes near a melanoma to see if the melanoma has metastasized. Punch biopsy. Punch biopsies are evaluations of a deeper sample of skin from an instrument that removes a short cylinder of tissue including the dermis, epidermis, and the most superficial parts of the subcutis. Excisional or incisional biopsy. 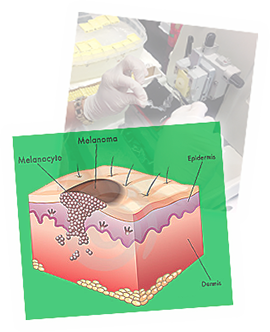 Excisional biopsy is the method usually preferred when melanoma is suspected. A full thickness of skin or all or part of a large tumor may be removed for further examination. Endoscopic biopsy. A pathologist examines tissue samples provided by a surgeon using a flexible endoscope. Bone marrow biopsy. SPL examines the number, size, and maturity of blood cells and/or abnormal cells from a small amount of bone marrow fluid (aspiration) and/or solid bone marrow tissue usually taken from the back of the hip bones.